In April 2014, Everything Dinosaur reported on the discovery of a bizarre Triassic marine reptile from south-western China called Atopodentatus unicus. 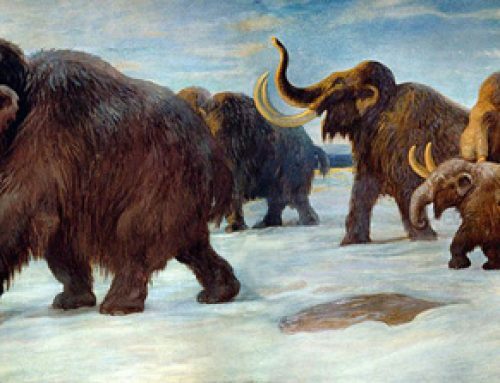 The skull and jaws were described as being highly unusual, with nothing like them having been found in the fossil record of marine vertebrates before. The upper jaw was thought to resemble a slit with small teeth forming a fine sieve or comb-like structure. This bizarre creature was assumed to be a specialist carnivore and it was held up as an example of how the marine ecosystems had bounced back and produced strange new animals in the shadow of the End Permian extinction event. It turns out that Atopodentatus may not have been so bizarre after all, however, its existence does help to support the theory that marine food chains did indeed recover remarkably quickly following the mass extinction that marked the end of the Palaeozoic. In a paper published in “Science Advances”, the skull and jaws of this three-metre-long reptile have been re-examined. Atopodentatus was certainly a specialist, but most likely a herbivore with a jaw shaped like a hammerhead used to graze on seaweeds and algae. As such, it is the earliest example of herbivory in marine reptiles, pre-dating the previously earliest known marine animals to have eaten plants by some eight million years. An illustration of Atopodentatus unicus. Picture Credit: Y. Chen, Institute of Vertebrate Palaeontology and Palaeoanthropology (IVPP). More fossils unearthed in China’s Yunnan Province by scientists from the IVPP allowed researchers to see further examples of the preserved skull and jaws, although flattened and crushed like other fossil material, analysis of the jaw and skull morphology using modelling clay led the scientists to conclude that Atopodentatus did not have “zipper jaws”, but rather a hammerhead structure, which is still a remarkable adaptation. A = Dorsal view of Atopodentatus skull, whilst B = Ventral view of Atopodentatus skull. The photograph shows two views of flattened A. unicus skull material (A) a dorsal view, from the top down and (B) a ventral view, viewed from the bottom. 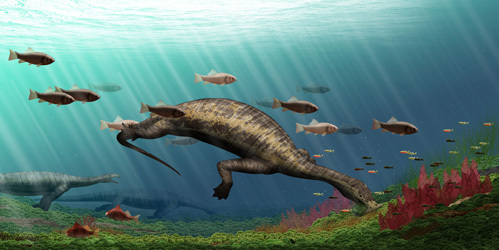 The scientists, which included Olivier Rieppel (The Field Museum, Chicago) and Nicholas Fraser (National Museums of Scotland, Edinburgh) as well as Li Chun (IVPP) and Cheng Long (Wuhan Centre of China Geological Survey), have deduced that this marine reptile rasped off algae and plants from rocks and then sucked in the suspended plant remains filtering out the food from the seawater using its needle-like teeth. Assessing the dentition and jaw morphology of Atopodentatus using modelling clay. The hammerhead shaped jaws, also described by Everything Dinosaur team members as an “upside down T shape” had peg-like teeth along their edges. Further back into the mouth, Atopodentatus had bunches of needle-like teeth. How Did Atopodentatus Feed on Plant Material? The spatulate, peg-like teeth lining the hammerhead were probably used to scrape off plant material such as seaweed and algae from submerged rocks. This would result in large amounts of plant matter being suspended in the water. This was then sucked into the mouth and filtered by the long, thin and closely packed needle-shaped teeth located more posteriorly in the mouth. Not only did the jaws of Atopodentatus resemble a vacuum cleaner attachment, it sucked like a vacuum cleaner too. A model of Atopodentatus shown against the flattened skull fossil. The evolution of such a bizarre-looking marine reptile, not long after the End Permian extinction event, helps to support the hypothesis that vertebrates bounced back relatively quickly following the mass extinction of much of the back-boned fauna of the Late Permian. However, instead of being placed in food webs representing the eastern Tethys Ocean of the Middle Triassic as carnivore (feeding on zooplankton and crustaceans), the position of Atopodentatus will have to be modified to reflect its diet.